It’s a workday and the last day and the good thing about work days is that it’s much easier to control your situation and eating opportunities. The Hunger Challenge food isn’t that bad so it’s just a matter of not exposing yourself to temptations, which is much easier on a weekday. Dinner brings the last two of what I’ve come to think of as the “Evil Enchiladas”. I can’t wait to go to bed and get up again to a new day. My clothes are noticeably looser, which isn’t an unwelcome occurrence. In conclusion, I feel changed by the experience. Never before have I paid so much attention to my emotions around food. Normally I look forward to the adventure of every meal and I love to cook with inspiring ingredients. The challenge put a huge crimp in that. 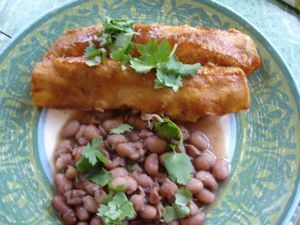 Though I often do eat exactly the kind of food I made for the challenge and I know I can eat healthfully and cheaply, the pure joy of dining was completely gone and there was no room for errors or bad enchilada sauce. I also have a clear realization of how much planning and preparation goes into eating this way. Not to mention food knowledge, equipment, time, and cooking skills. Eating well on $4 a day requires a predictable, chaos free life, something I don’t think most people have. I also feel that it’s likely that the more you are struggling, the less predictable your life is. Without the time to cook and the joy attached to cooking, I can completely understand why people fall back on the $1 fast food meals. And we’re not even talking about the issue of healthy food access, which is a huge one. I wish I had the answers that would give people in need the resources they need to cook for themselves. Perhaps it would be community kitchens, similar to the Food Bank’s pantries. Kitchens equipped with stoves and pans and knives where people could come and share resources and work together to cook the food that will feed their families. For me, I’m glad I can now go back to my self-indulgent ways. I’m eating more slowly, mindfully, and appreciatively than ever before. The Hunger Challenge has made me grateful for every bite and I aim to stay that way. Here are links to all the other Hunger Challenge Bloggers. Make sure you check out their experiences too! Been There Ate That – 2nd year! Beets and Biscuits – New! Blog Appetit – 2nd year! Cooking with Amy – 2nd year! Heat Eat Review – New! Hoos on First – New! I Do Not Think That They Will Sing To Me – New! Maria Niles – 2nd year! Michael Dimock – Roots of Change – New! Midtown Mark's Hunger Challenge – New! Muse in Vivo – New! My Life in Food – New! Petit Appetit – 2nd year! Poor Girl Eats Well – New! Some Dreams Come True – New! Stellajade by Sarah W – New! The Guerilla Gourmet – New! The Inadvertent Gardener – 2nd year! This entry was posted in Latin American, food justice, hunger challenge. Bookmark the permalink. Post a comment or leave a trackback: Trackback URL. I liked your reference in a previous post about contrived vs challenge. We just get to “visit” this world, we don’t have to live here full time. I can’t even begin to imagine what that would be like. Thanks for the sensible critique. Me & my neighbor were just preparing to do a little research on this. We got a grab a book from our local library but I think I learned more clear from this post. I am very glad to see such great information being shared freely out there.